On a May weekend I had a trip planned with some friends into the famed Chiputneticook Lake system of western New Brunswick and eastern Maine. 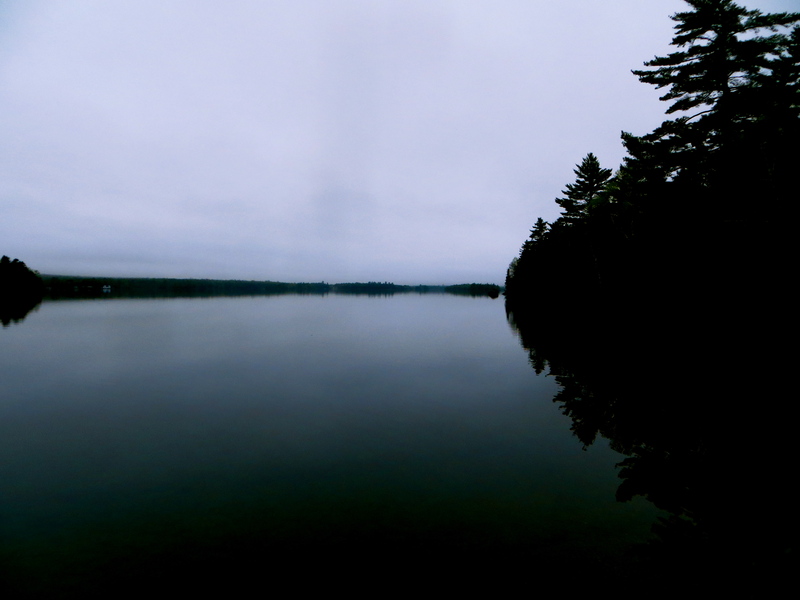 These lakes comprise the headwaters of one of Canada’s most culturally significant rivers, the St. Croix River. Our group proposed to travel roughly 55km from the north end of North Lake, across East Grand and Spednic Lakes to Spednic Lake Provincial Park. Unfortunately for us, the forecast for the weekend did not look promising — they were calling for abundant precipitation. Despite the negative forecast, the group agreed the trip was a go; consensus was we didn’t just suffer through a long, hard winter to be deterred by a little rain. The section from North Lake to Davenport Cove on East Grand Lake is part of the ancient canoe route known as the Maliseet Canoe Trail. The route extends over 200km from just outside Woodstock, New Brunswick to Old Town, Maine. It crosses three major watersheds — the Saint John, the St. Croix, and the Penobscot Rivers — and served as an important travel corridor for Maliseet, Mi’kmaq, Penobscot, Passamaquoddy, and European people at different times throughout history. In the last 85 years only three parties have traversed the entire trail, the most recent of which was in 2005. The 2005 crossing featured several esteemed adventurers and can be read about online — a must read. While our trip was unlikely to be historic, it presented a challenge to the participants in it’s own right. My Old Town Discovery and I rolled into Spednic Lake Provincial Park late Friday afternoon where we met up with our bowman Shane and our tripmates. The sun was shining, the sky was blue, we were crazy to have considered cancelling! The only issue was the shortcut via highway 630 was washed out. Because of our circuitous shuttling route, we arrived at North Lake late in the evening. The fading daylight forced us to shorten our paddle by putting in at the border crossing between East Grand and North Lakes. From here it was a short paddle to our destination for night one, Blueberry Point on East Grand Lake. Someone in our group replied with something like, “well we’ll give it our best shot” and he shook his head in a way that suggested he’d go ready the rescue boat. Of course — as they often are — the old man was right. We emerged from behind the point and a strong headwind was blowing from the east. Skirting the shoreline wasn’t possible, there were only two options, wait it out or travel straight across. It was early in the trip and we were full of energy so Shane and I decided that we could handle the crossing. We hit the open water paddling hard with little to show for our efforts, while our companions did the smart thing and waited for the wind to die down. Their decision was the correct one, they arrived at the far bank shortly after us. The Blueberry point campsite was not where we expected it to be, it had been moved down the shoreline. The new site was rustic to say the least — it was damp and rocky, with few level spaces for a tent. With three tents, it was a tight squeeze for our group. One other awkward note: the privy is located effectively in the heart of the sight. With that said, we were in the woods and sitting around a campfire with good company — tough to complain about that. Say what you will about the Blueberry Point campsite, but at least there were chairs! 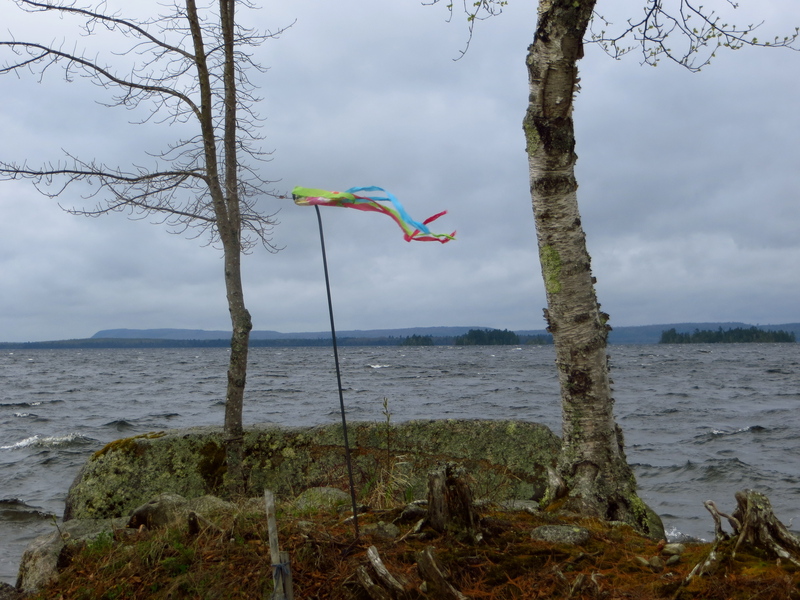 Overcast skies and a moderate breeze coming from the south greeted us in the morning. The water in the vicinity of our site looked calm and paddleable. Unfortunately, a member of our group announced he was feeling sick and had decided he wouldn’t be making the rest of the trip. After some discussion we decided to press on. Conditions on the lake were deceiving. The water was calm in the narrow stretch from before Spruce Point, but we were greeted by white caps and intense wind as we gazed across the bay toward Hayes Point and the Five Islands. Watching the force of the waves as they crashed into the shore did not fill us with confidence. We learned our lesson the previous evening, and decided to take refuge at the Spruce Point campsite. 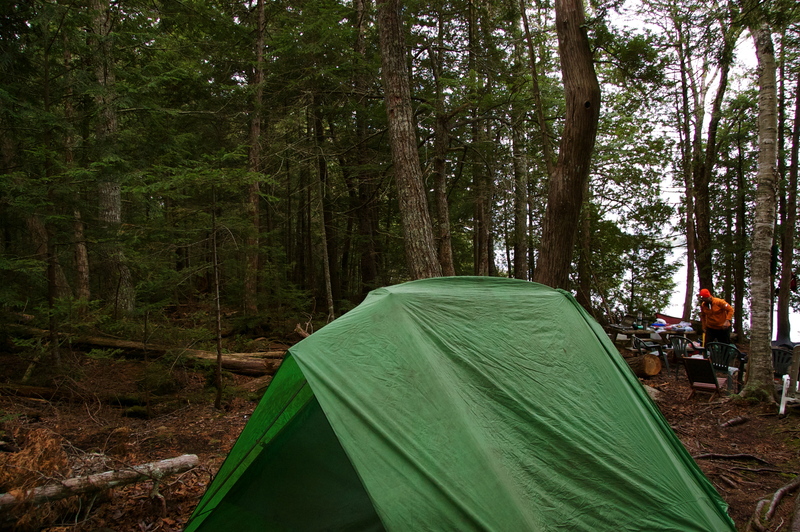 This site is a long, waterfront campsite with the firepit connected to the tenting area via a short trail. 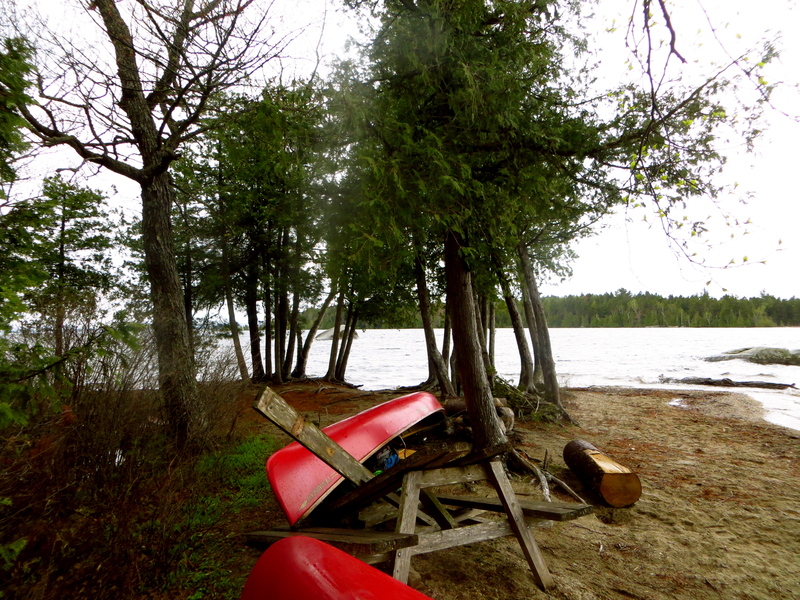 The best access is via a nice sandy point with some struggling cedars and a broken old picnic table. Sadly, the rain arrived soon after us — around 11:00 a.m. The view out across the bay looking toward the Five Islands, the winds were relatively calm here. 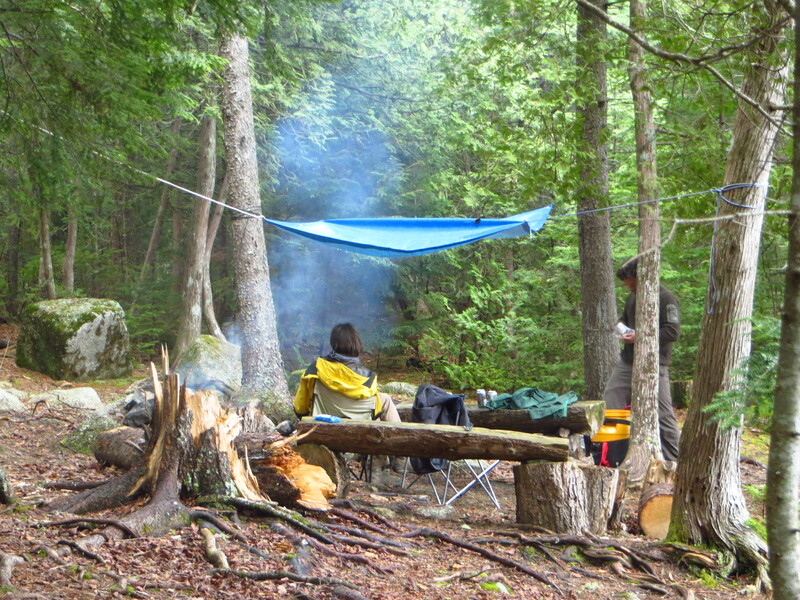 After setting up a tarp, putting on a fire and enjoying a coffee, the weather still hadn’t broken. We’d traveled a total of 1.5km — roughly 5km out of the proposed 50km — and steady cloud cover suggested that we weren’t going anywhere. With enough firewood to last for multiple days we explored the area on foot. Mostly lowland species comprised the surrounding forest — cedar, black spruce, and the ubiquitous balsam fir. 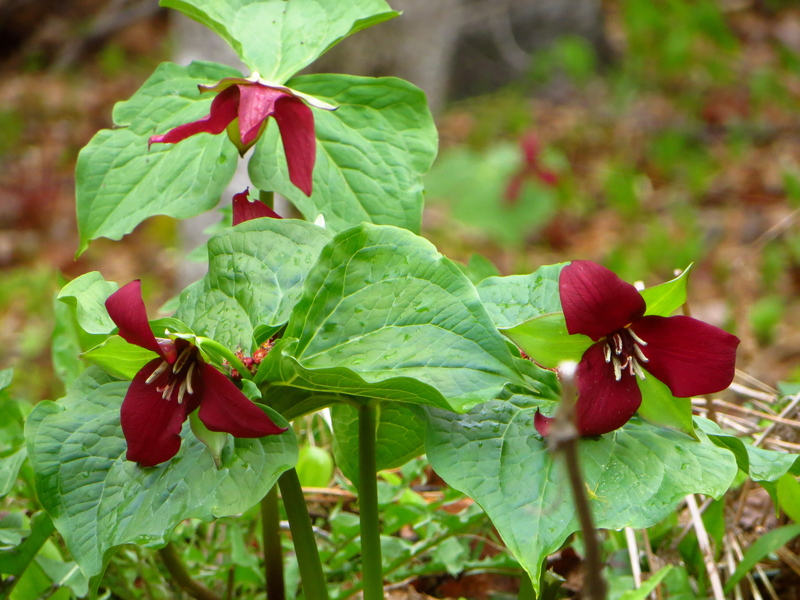 Fiddlehead season had just concluded and Trilliums were in full bloom. When 4:00pm rolled around the decision was made to setup camp and to start working our way through the beer supply. A couple of soggy, bored campers wondering if it’s time to open a beer yet. Steaks were on the menu for supper, but because we neglected to bring a grill and there wasn’t one on the site, Shane and I were forced to improvise. 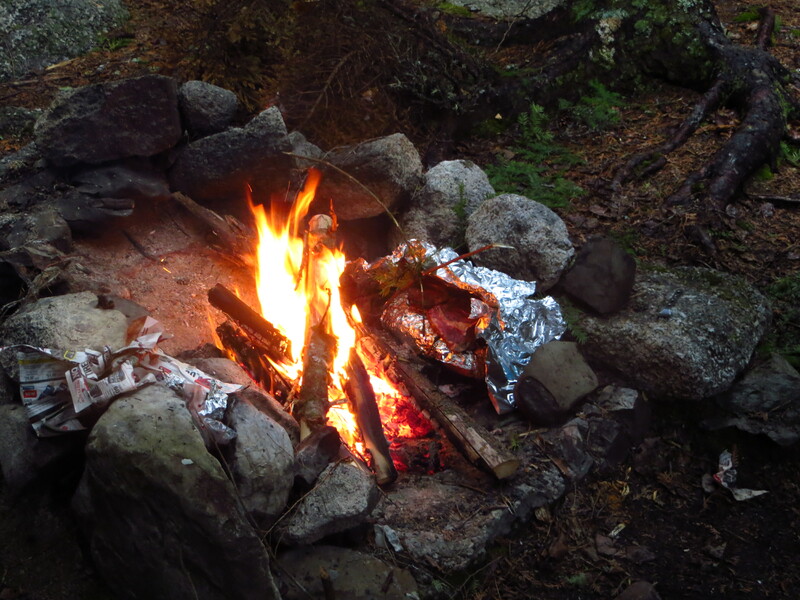 We constructed a feeble reflector oven with tinfoil and a wooden frame, using rocks to seal off the sides and back. It got the job done — eventually — and the steaks were delicious, but then again an old boot with some steak spice may have been just as enjoyable. The night ended early with the group resolving to get up before sunlight and make a decision about moving forward. Our worthless reflector oven in all its glory. The steaks were still delicious. At 5:30 a.m. thick grey clouds hung low in the sky but, more importantly, the wind had died in the night and the water was a smooth as glass. The group conceded to packing up camp and hitting the water without breakfast or even coffee. At this point the trip was in jeopardy and we needed to take advantage of our opportunity to get across the open water between Spruce and Hayes Points. After a couple handfulls or trailmix we — finally — resumed our voyage. Out on the lake a soft, grey gloom engulfed our boat. Navigation by sight became impossible — the fog was so thick that we drifted off course and ended up near the Maine coastline. We headed west toward the American shoreline on a compass bearing and followed it until Work Point, and from there we paddled across to the Hayes Point campsite — where our tripmates were waiting, with coffee.